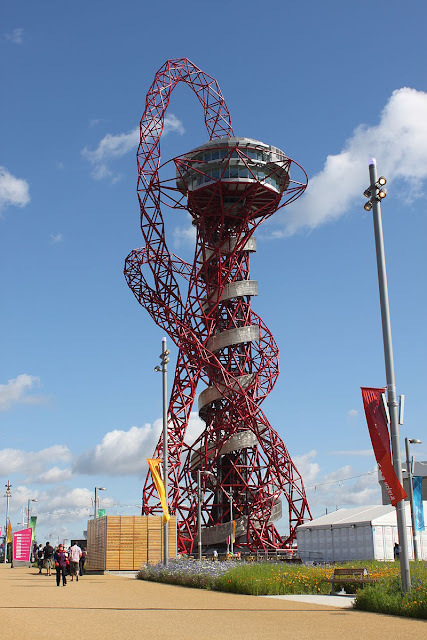 The ArcelorMittal Orbit, a 114.5 metro tall sculpture as well as an observation tower is located in the Queen Elizabeth Olympic Park in Stratford, London and is the largest piece of public art in Britain. It was intended to be a lasting legacy of London’s hoisting of the 2012 Summer Olympic and Paralympic Games supporting in the post-Olympics renewal of the Stratford region. Placed in the midst of the Olympic Stadium and the Aquatic Centre, it enables tourists to catch glimpses of the whole Olympic Park from two observation podiums. The Orbit had been designed by Sir Anish Kapoor, Turner-Prize winning artist and Cecil Balmond of engineering Group Arup. It was announced on 31 March 2010 and was expected to be completed by December 2011 and the project came up after Mayor of London Boris Johnson and Olympics Minister Tessa Jowell decided in 2008 that the Olympic Park required something extra. Ideas were requested from designers for Olympic tower of at least 100 metres and the Orbit was the agreed choice from nine person advisory panel proposals. The construction of ArcelorMittal Orbit took around 18 months with 560 metres of tube-shapedred steel to create the sculpture’s lattice superstructure. The outcome was a bold statement of public art which was both permanent as well as sustainable with around 60% of the 2,000 tonnes of steel utilised in the sculpture drawn from recycled sources which underline the steel’s status as the most recyclable material in the world. Steel was the choice for this project due to its unique properties which included strength, modular structure as well as advantages of weight and speed of construction. Visitors can now take a trip to the top of the structure via a lift and down too if they prefer though they could also be encouraged to walk down the spiral staircase that has around 455 steps and is designed to allow guest in experiencing the feeling of orbiting around the structure while descending. Chief Executive of the London Legacy Development Corporation, Andrew Altman has commented that `the ArcelorMittal Orbit will become one of London’s most spectacular visitor attractions and a stunning backdrop to the Queen Elizabeth Olympic Park. It would not only offer differing views by day and night, but will light up the East London skyline to become a beacon of the incredible transformation of this part of East London’. The project was predicted to cost £19.1 million wherein £16 million came from Britain’s richest man, the Chairman of the ArcelorMittal steel company, Lakshmi Mittal, the steel tycoon while the balance £3.1 million came from the London Development Agency. ArcelorMittal Orbit is the combination of the name of Mittal’s company as chief sponsor, with Orbit, the original working title for the design of Kapoor and Balmond. Both the designers were of the belief that Orbit represented a radical advance in the field of architecture with the combination of sculpture and structural engineering uniting both stability as well as instability in a labour which visitors could engage with as well as experience through an incorporated spiral walkway. This structure has gained appraisal as well as criticism for its bold design. It has also been disapproved as a vanity project of questionable lasting use or merit as a public project of art. After the 2012 Olympic and Paralympic Games, the ArcelorMittal Orbit was closed, while the South Plaza area of the Park where the Orbit is positioned, had undergone reconstruction and was re-opened to the public on 5 April 2014.Boris Johnson had commented that the `114.5 metre high attraction to trump rivals the world over is a calling card for investment in East London’. It is a symbol of prosperity and growth, backed by one of the world’s most astute business leaders, delivering the strongest message that this part of London is open for business after decades of neglect’. Comments from Anish Kapoor states that `he is absolutely delighted that construction is complete and would like to thank the project team for making this possible and for the work on what is technically a very challenging project’. He is of the belief that when visitors come to the Park during Olympic, they would be able to go up the ArcelorMittal Orbit for the first time and would be delighted that members of the public would be able to interact with the work in this way.Cecil Balmond had commented that, `Anish and he were conscious from the beginning that the ArcelorMittal Orbit would be a lasting legacy to the city and so wanted to stretch the language of the icon as far as it could go. The Orbit is a hybrid, a network of art and structure and its dynamic is the non-linear. You could read into it multiple narratives in space’.It is presumed that due to visitors, it would generate around £10 million of revenue yearly creating job opportunities after the 2012 Olympic and Paralympic Games.